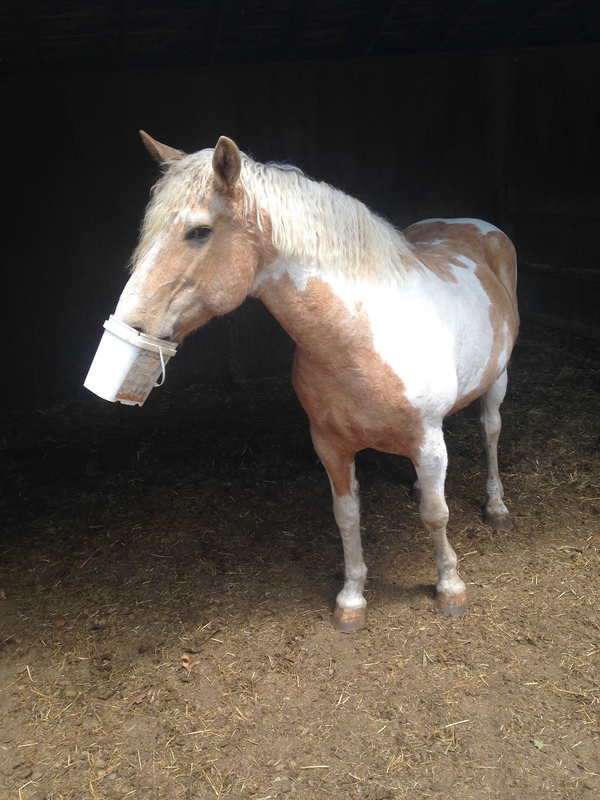 Curly had the bucket stuck on her nose for a minute or two. Sadly for her, it was empty. Yesterday the horses got fall shots, including the dreaded Strangles intranasal vaccine. This year we have no stalls, so convincing horses that they wanted to stand still while the syringe is stuck up their noses was, well, challenging. Curly, usually the mildest member of our herd, is the most difficult when it comes to the Strangles vaccine. She can sense that it’s coming and, even when in a stall, she does not make it easy. 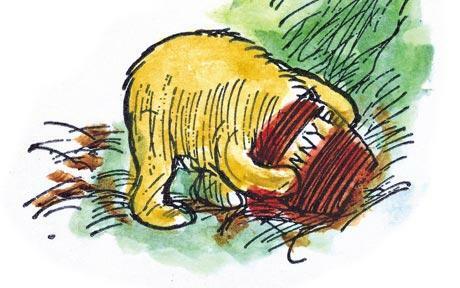 The classic Winnie the Pooh illustration of Pooh getting his head stuck. After the traumatic event, Curly got a bit more grain. I left the bucket on the ground and turned around to see it hanging off her nose! It didn’t worry her in the least. Just like Winnie the Pooh and his honey pot. Okay, true story regarding a twitch. My daughter rides not I, so what I know about horses I know through taking her to the barn, staying at the barn, about six days a week, for YEARS, and through her or her instructors. One time we go to the barn and the vet had been called out to see a horse for colic. I see him get out an obviously man-made something that was a long stick of wood with a looped leather cord at the end. All I could think of “What in the hell is that and where is he going to stick it?!? !” Then he used it as a twitch. I had never seen one before so I had no clue until he used it for its proper purpose. I told the vet and the trainer what thoughts had run through my mind. We all had a good laugh over that one!